Sure spring training is sun and fun for the fans, but it really serves an important purpose for the players. 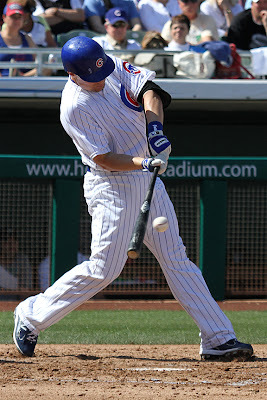 I’m going to dispense with the game rundown of today’s Cubs 10-3 loss to the Seattle Mariners and instead focus on a few things I took away from today’s contest. Big Chris Volstad, who was acquired from the Marlins for Carlos Zambrano, got his first Cactus League start for the Cubs and looked dominant. It’s very early yet, so we shouldn’t read too much into one 3 inning performance, but I sure like what I saw. 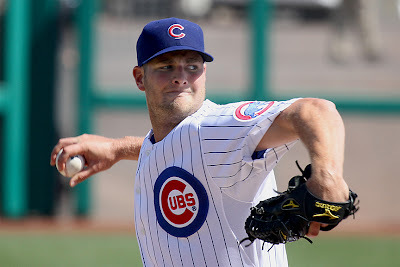 Volstad, who is competing for a spot in the rotation, has been working with Rick Sutcliffe and pitching coach Chris Bosio this spring on the mental game and placement of his pitches, among other things. 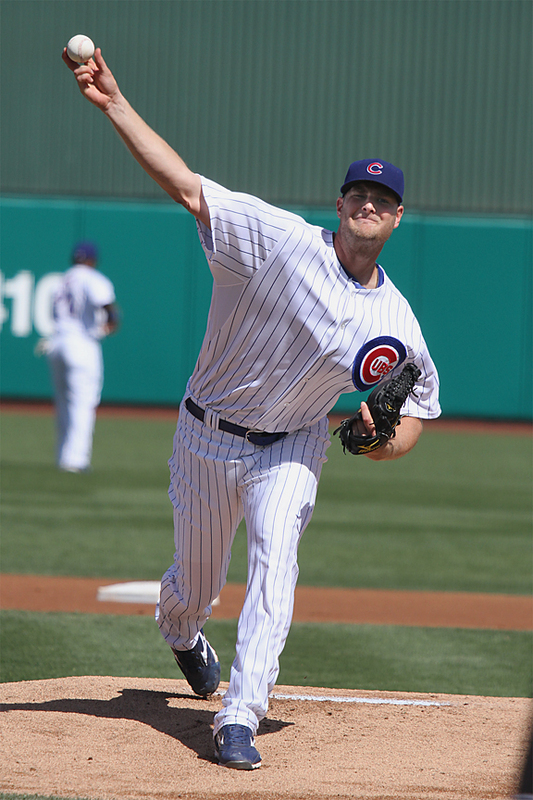 Being only 25 years of age, the big right hander could really benefit from this kind of tutoring, which could pay big dividends for the Cubs down the road. A former first round pick of the Marlins, Volstad has already logged some serious MLB innings – nearly 600. Compare that with one of his competitors for the rotation, 27 year old Jeff Samardzija (who has been used mainly in relief), Samardzija has logged less than 170 MLB innings. Volstad seems to be at his best when working inside on batters. 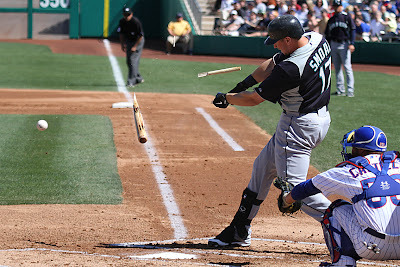 The evidence today was 2 broken Mariners bats (and 3K’s), including sawing off Justin Smoak while turning Smoak’s bat into shards of kindling. I was sneaking a peak at the scout’s radar guns today and noticed Volstad was clocking around 91 and 92 mph so his velocity wasn’t overpowering. It will be interesting to see how he progresses as he gets his innings stretched out over the spring. On the flip side, was Carlos Marmol’s tough outing as he allowed 4 runs on 4 hits, including a home run in two thirds of an inning. As you probably are aware Marmol is working on his fastball right now and as he stated, isn’t much concerned about what happened in today’s game. Marmol is trying to get more pitches at his disposal, more pitches that compliment his sick slider. If this was 3 weeks from now, towards the end of spring training, I might be concerned. 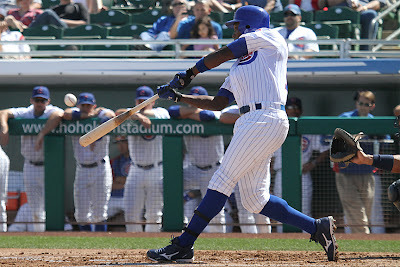 Alfonso Soriano looks in great shape and is very strong this camp. We all know about his defensive issues but the guy can flat out pound the baseball. He hit his third home run of the spring today, the ball landed just to the left center side of the batter’s eye, around 425 feet. When he’s in the groove it’s almost impossible to get this guy out. Let’s hope manager Sveum’s emphasis on defense is taken to heart by Soriano; just one more thing to keep an eye on as we move forward this March. Miscellaneous from today: Junior Lake came up to bat with his Jersey untucked and hanging way out, looking quite disheveled. Since Theo Epstein and GM Jed Hoyer sit in the first row, I’m wondering if that will be a topic of conversation with the youngster. Epstein, Hoyer, and Sveum are all about doing things the right way. I’m guessing if you can’t keep your jersey tucked in, that may be an issue. Kerry Wood got into his first Cactus League game to a nice round of applause and tossed a scoreless inning. Marlon Byrd hit a rocket shot straight up the middle that Kevin Milwood somehow speared with the reflexes of a hockey goalie, robbing Byrd of a hit. A foul ball went into the Mariner’s radio booth, it’s a very tough trajectory to get one back over the screen into the booth. They tossed the ball out to a young fan. 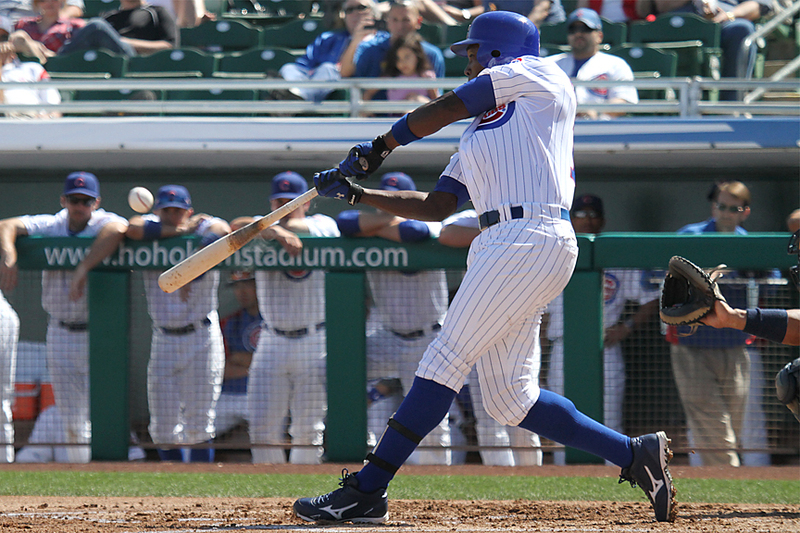 Cubs are headed to Glendale tomorrow to take on the cross town rival White Sox. The game is on WGN, unfortunately it’s with the Sox announcers, so you will want Len Kasper’s audio from Cubs.com. All today’s photos are by BOS ace game photographer John Antonoff.